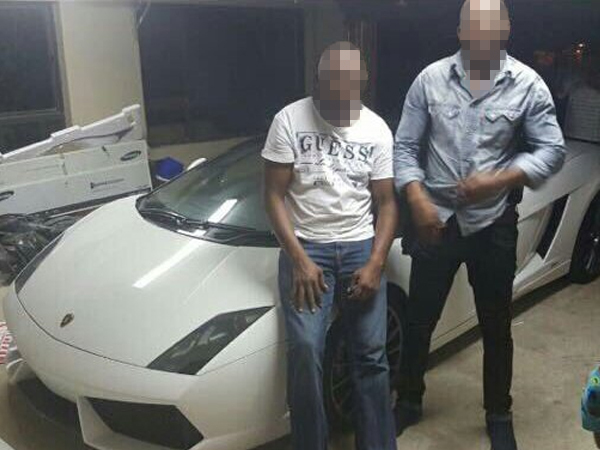 A man photographed with a R5m Lamborghini, that was apparently linked to one of the men arrested for the recent heist at the OR Tambo International Airport, claims that he is actually a police officer investigating the case. A man photographed with a R5 million Lamborghini, that was apparently linked to one of the men arrested for the recent heist at the OR Tambo International Airport, claims that he is actually a police officer investigating the case. He wrote on his personal Facebook account: "So everyone thinks I'm [the] OR Tambo thief, haai." "Calypso ke nna bra [it's me brother] the foto was taken in the house of suspect when we arrested him [sic]," one of his replies on the post said. The picture shows two men posing next to the car in a garage. The picture went viral on social media on Monday, with several people saying that the two were part of the gang who had been arrested for the OR Tambo heist. It is not immediately clear if the car in the picture is the same one linked to one of the suspects. On Sunday, five suspects allegedly linked to the heist were arrested. An estimated R24m in foreign currency was stolen. A highly placed source told News24 that the men were arrested in a joint operation with the Hawks, the provincial tracking team and crime intelligence on Friday and Saturday. One of the suspects arrested at a luxurious Centurion estate was found in possession of a Lamborghini and a large amount of cash. Three other people and a police officer were also arrested. In a further response to the picture, the man who claimed to be an officer wrote: "I know who posted the pic he was not suppose to but anywhere justice in action [sic]." The money was stolen from an aeroplane at the airport earlier in March. Suspects in a marked police vehicle intercepted the money after a South African Airways flight landed, News24 reported on March 7. A white Mercedes-Benz is believed to have also been used in the operation. A high-level investigation involving all law enforcement agencies is underway.